Every Ninja Turtle needs a place to relax after a long day of fighting crime, practicing with master Splinter, or a day in school. The Nickelodeon Teenage Mutant Ninja Turtles plastic frame upholstered chair not only gives relaxation, but also ignites imagination. Watch your kid enter the word of the Ninja Turtles and enjoy his afternoon. Its the perfect kids-only spot for reading and watching movies, it makes any activity extra special. Made of durable molded plastic frame and foam padding that can hold up to 100 pounds. SOFT AND COMFY. Comfortable place to kick back and relax for any ninja after dealing with shredder's foot soldiers, or a place to just simply unwind and enjoy a book or pizza. PRESCHOOL FUN. Enhance the child's imagination as they enter the world of Leonardo, Donatello, Michelangelo, and Rafael. A classic and fun way of enjoying the afternoon with TMNT. PERFECT KIDS SPOT. Ideal for kids 3 - 6 years old. The chair is made of high quality plastic frame and can hold a weight of up to 100 pounds (lbs). EASY CLEAN UP. Ninja Turtles love pizza. Easily remove stains by removing the slip cover which is machine washable. 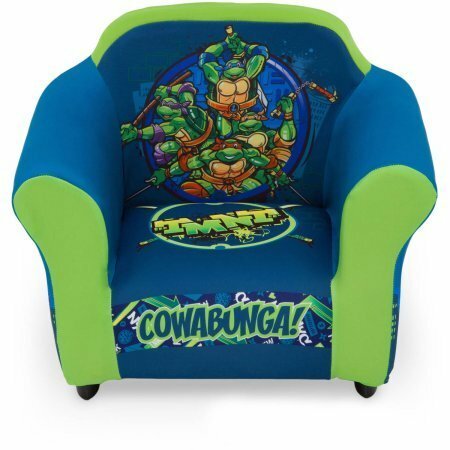 WHAT YOU GET: 1 Ninja Turtles kids sofa chair with dimensions of 22.5 inches in width x 16" depth x 17.25 inch height. Assembly Required.